The increasing use of conservation tillage, no-till, and cover crops is changing the way we view the soil and the environment. New concepts and terminology are being used to describe these changes. Understanding the terms defined in this fact sheet will help farmers understand relationships between tillage, crop rotation, cover crops, carbon sequestration, organic matter pool, agricultural sustainability, and soil and water quality. Sustainable agriculture and soil quality are terms that are increasingly important to modern farming. With higher costs for labor, seed, fuel, fertilizer, and pesticides, agricultural producers are looking for more economical ways to improve crop production and maintain ecosystem sustainability. One of the goals of sustainable agriculture is to work with the natural cycles of the terrestrial ecosystems, especially with the soil biology to enhance the efficiency of agricultural management practices. The terms below are used to describe these biologically efficient and economically viable agricultural production systems. The terms are listed in alphabetical order. Actinomycetes: A large group of rod-shaped or filamentous bacterium that includes some that cause diseases and some that are the sources of antibiotics. These soil microorganisms generally resemble fungi and have branched mycelium. Active Carbon (AC): The portion of total soil organic carbon (matter) that is relatively easily metabolized or utilized by microorganisms. The half-life of active carbon ranges from a few days to a few years. Active carbon would include simple polysaccharides and glucose equivalent reduced sugars, amino acids and proteins, soluble and extractable carbon, and microbial biomass carbon, etc. Aerobic: Aerobic means in the presence of oxygen or growing in the presence of oxygen. Aerobic soils have plenty of oxygenated air to carry out oxidative reactions, such as soil organic matter decomposition and nutrient cycling. Aggregates: Primary soil particles (sand, silt, and clay) held together in a single mass or cluster, such as a crumb, block, prism or clod using organic matter as cementing material. Soil aggregates are usually greater than ten millimeters in diameter and formed by natural forces (such as alternate wetting-drying) and organic substances derived from root exudates, roots, soil animals and microbial by-products which cement primary particles into smaller aggregates or smaller aggregates into larger particles, such as macroaggregates. Air Quality: Defined as a measure of the amount or concentration of pollutants emitted into the atmosphere and the dispersion potential of an area to dilute those pollutants. The common air pollutants are ground-level ozone, carbon monoxide, sulfur dioxide, nitrogen oxide (e.g. N2O), radon, and emitted heavy metal dusts. These pollutants can harm field crops, public health, birds and other animals, and the environment, and cause property damage. Carbon dioxide and N2O are greenhouse gases that are normally present in the atmosphere, but at higher levels may contribute to global warming. Anaerobic: Absence of oxygen or growing in the absence of oxygen. Soils that are heavy textured (clay), compacted, wet or flooded tend to be anaerobic because they have less oxygenated air to carry out oxidative reactions. Anaerobesis of soil is also responsible for widespread soil-borne diseases. Bacteria: A large group of single-celled microorganisms lacking chlorophyll and are prokaryotic (lacking a nucleus). Typically a few micrometers in length, bacteria have a wide range of shapes, ranging from spheres to rods and spirals. Bacteria are important for functioning of biochemical properties and/or processes. Bacteria are active in the soil for decomposing organic matter, recycling nutrients, and detoxification of contaminants. Bacteria dominate in disturbed (e.g. conventionally tilled) soils because they are generalist feeders that prefer aerobic (oxygenated) conditions, and survive in small soil pore spaces (micropores). Basal Respiration (BR): Respiration, or oxygen used, by soil microbes to decompose organic matter or any crop residues as a food and energy source and released as carbon dioxide into the soil atmosphere. Soil respiration is a direct and sensitive assessment of soil antecedent biological activity. A high BR generally indicates higher soil microbial activity, however, not biological efficiency. Bulk Density (ρb): The mass (weight) of unit soil divided by the total volume occupied. An ideal soil has a bulk density of about 1.25 g cm-3. Bulk density is the total soil porosity. Compacted soils have a bulk density of 1.5 g cm-3 or higher. Carbon-Nitrogen Ratio (C/N): Ratio of the mass (weight) of organic carbon to the mass of total nitrogen in the soil, plants, or any other organic compounds. Soil C:N is generally 10:1 to carry out ecological functions. Carbon Sequestration Index (Cindex): A new term explains the simple and integrated index that identifies the rate of carbon accumulation in the soil. This index can be used as an early and sensitive indicator of carbon or soil organic matter accumulation and could help explain the complex nature of global carbon cycling. Catalyst: Chemical substances generally produced by microorganisms or plants that promote biochemical reactions by lowering the energy needed during a reaction. It is not changed or consumed during the reaction. Catalysts are important in the soil in speeding up biochemical reactions and are usually only present in minute amounts. Cellulose: The greatest amount of carbon in a plant in the form of carbohydrates is cellulose, which gives plants structural rigidity, and allows plants to grow erect. As a plant matures, the cellulose content of the plant generally increases. Conventional Tillage (CT): The combined secondary and primary tillage operations performed in preparing a seedbed in a given geographical location. Examples of primary tillage include moldboard plowing, chisel plowing, and sub-soiling, while finishing tools like a disk, field cultivator, or cultipacker would be considered secondary tillage. Conventional tillage means that the soil is physically turned over (or loosened), and oxygenate. This process accelerates breakdown of crop residues and native soil organic matter and temporarily increases microbial respiration. Soil organic matter decomposition releases nutrients, especially N, but it also destroys soil structure and macropores leading to soil compaction and decreased soil organic matter levels. 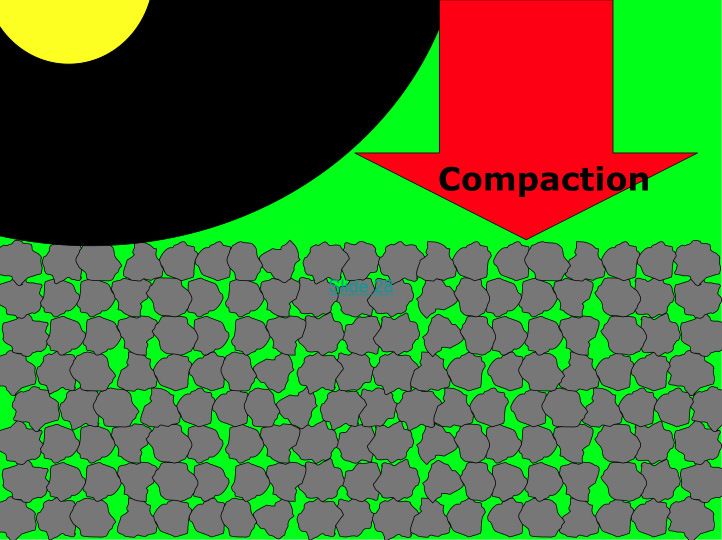 Soil compaction physically shrinks the soil volume by reducing the macropores and the space for air and water movement. Compacted soils hold less air and water and are denser than uncompacted soils. Ideally, a soil should have 50% pore space in a soil with 50% mineral. Decomposition: Biochemical breakdown of plant or animal residues into simpler compounds, often accomplished by soil food webs especially microorganisms. Deductive Soil Quality: A measure of soil quality, based on crop production from the soil, such as grain yield, hay, fruits, and other outputs. Denitrification: Reduction of nitrogen (e.g. nitrate or nitrite) to molecular nitrogen or nitric oxide by microbial activity or biochemical activity. Typically, it occurs under anaerobic (lack of oxygen) conditions when soil is wet and compacted. The result is a loss of nitrogen to the atmosphere. Ecosystem Services: The resources and processes supplied by natural ecosystems that benefit humans. Collectively, these benefits are known as ecosystem services and include products like clean drinking water and processes such as the decomposition of wastes. Ecosystem services have been grouped into four broad categories: provisioning, such as the production of food and availability of water; regulating, such as the control of climate and diseases; supporting, such as nutrient cycles and crop pollination; and cultural or social, such as norms, ideas, and spiritual and recreational benefits. Eutrophication: Enrichment of natural fresh waters with excess nutrients (especially phosphorus) that lead to algal blooms and subsequent oxygen deficiencies when the algae die and start to decompose. However, both nitrogen and phosphorus are responsible for sea water eutrophication, such as in the Gulf of Mexico. Fulvic Acid (FA): Light yellow colored material that remains in solution after separating humic acid from humus by acidification. Fulvic acid is less dense, more alipathic, and has a low molecular weight compared to humin and humic acid but has a high nitrogen content that is more available to plants. It is soluble in any pH levels. Fungus: Microorganisms that contain a rigid cell wall that are either single-celled or multicellular organisms without chlorophyll that reproduces by spores and lives by absorbing nutrients from organic matter. Fungi include mildews, molds, mushrooms, rusts, smuts, and yeasts. Fungi survive better under no-till or undisturbed ecosystem and slightly acid conditions. They do not perform well in plowed fields due to their extensive hyphae (spider web like) networks affected by tillage operations. Glomalin: A glycoprotein (sugar-protein complex) produced by mycorrhizal fungus (e.g. Glomus spp.). Glomalin binds soil particles together to form aggregates to promote soil aggregate stability and are important in the storage of soil carbon. Diagram of the soil microenvironment with plant root hairs, bacteria, mycorrhizal fungus, actinomycetes, and protozoa interacting in the soil. Photo courtesy of Eliot, USDA-NRCS. Hemicelluloses: Consists of polymers that branched, the second most common carbohydrate (up to 30%) in plant residues. Hemicelluloses generally contain of several types and forms due to condensation of sugars. Pectin is an example of hemicelluloses. Humic Acid (HA): Dark colored organic material extracted from soil by various reagents (such as dilute alkali) and is precipitated by acid. Humic acid has a relatively high molecular weight and is dense, aromatic, and dark brown to black in color. It is relatively stable compared to fulvic acid and essential for soil cation exchange capacity and formation of soil structures. Humic Substances (HS): Series of relatively high molecular weight organic substances which are brown to black in color. Make up 60 to 80% of soil organic matter and are generally partial decomposable to resistant to microbial decomposition. They have a hydrocarbon structure composed of C-C, C-N, C=C, and C-O-C bonds. Humification: Process by which the carbon of organic substances is transformed and resynthesized to humic substances through biochemical and physio-chemical processes. Humification Degree (HD): The ratio of humic acid (HA) and fulvic acid (FA) to total humified organic matter, HD = (Humic acid + Fulvic acid)/ (Total extracted C)*100. The greater the HD, the higher the soil organic matter polymerization and condensation. In other words, high DH means the organic matter is more resistant to decomposition. Humification Index (HI): A ratio of non-humified carbon or glucose carbon, divided by total humified organic carbon, HI = (Non-humic C)/ (Humic acid + Fulvic acid)*100. Higher HI indicates less humification of soil organic matter. Humification Ratio (HR): The ratio of humic acid plus fulvic acid divided by total carbon, HR = (Humic acid + Fulvic acid)/ (Total organic C)*100. Low HR indicates less humification of soil organic matter. Humin (HN): A fraction of soil organic matter that cannot be extracted from soil with dilute alkali or acid. Humin is a very stable fraction of soil organic matter due to its strong association or bonding with clay minerals and metal ions. Humus: Total of the organic compounds in the soil excluding undecayed plant and animal tissues. Humus equals fulvic acid plus humin, plus humic acid. The term is often used to describe soil organic matter. Humus is generally dark in color. Hypoxia: Insufficient oxygen in an environment to support aerobic life. Usually occurs in estuarine and sea water (including Gulf of Mexico) from an excess of nitrogen and phosphorus which promotes the growth of algae. When the algae die, the decomposition uses so much oxygen other life is harmed. Inductive Soil Quality: A measure of soil quality based on soil characteristics and/or processes that regulate the functional behavior of the soil, such as hydrologic properties, microbial activity, emission of gases, organic matter, and nutrient availability. Infiltration: The entry of water into the soil. Infiltration is affected by several factors including antecedent soil moisture content, soil compaction, soil texture, earthworms, and plant roots. Labile: A substance that is readily transformed or used by microorganisms. Labile organic matter is often associated with active organic carbon to regulate soil quality. Legume: Legumes are plants associated with nitrogen fixing organisms and include peas, beans, peanuts, clovers, alfalfa, lespedezas, vetches, and kudzu. Lignin: Lignin is the third most common component of plant residue. It is prominent in woody or mature tissues and increases as a plant ages. Lignin is a very complex energy-rich molecule and varies greatly in structure, making it hard to decompose. Lignin helps cement cell walls together to provide structural support for plants. 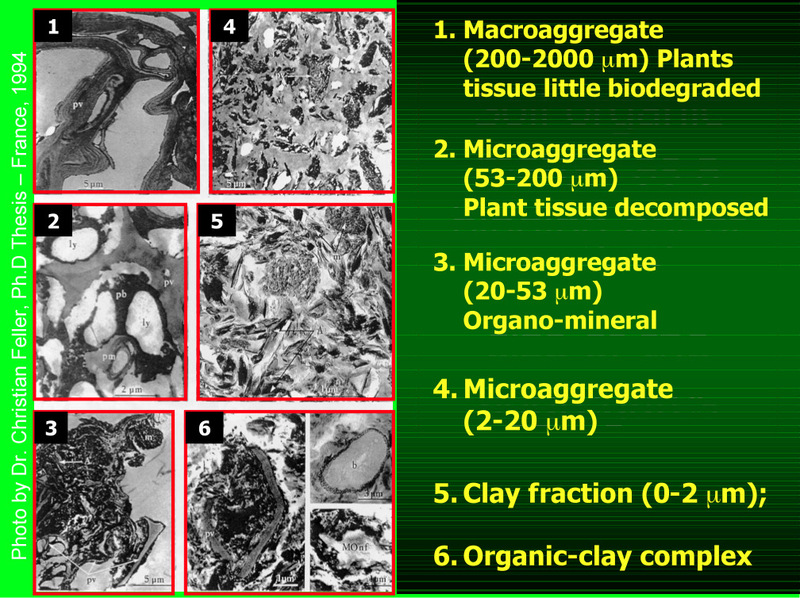 Macroaggregates: Soil aggregates greater than 250 micrometers in size consisting of microaggregates cemented together by organic matter, microbial polysaccharides, fungal hyphae, earthworm excretions, and plant roots. Macroaggregates are typically found in undisturbed soils such as continuous no-till with cover crops. Macropores: Larger soil pores (greater than 60 micrometers) from which water drains readily by gravity. Macropores are important for soil aeration and good drainage. Mesofauna: Animal life of medium size (between 2 and 0.2 millimeters in diameter). Examples include centipedes, nematodes, and mites. Metabolic Quotient (qR): A ratio of total microbial biomass carbon over total organic carbon. A high qR is an indication of an enlarging biological carbon pool in total organic carbon. It typically ranges from 0.5 to 5% in soil. Microaggregates: Soil aggregates less than 250 micrometers in size consisting of primary particles, plant roots, and humin cemented together. Microaggregates are more typically found in disturbed or cultivated soils. Multiple microaggregates may form larger macroaggregates through microbial activity, plant root exudates and actions, fungal hyphae, and earthworm casts. Microbial Biomass: Includes the smallest living organisms such as bacteria, fungus, protozoa, algae, actinomycetes, nematodes, and nonliving organisms: prion and viruses. Microbial biomass denotes a small portion (less than 5%) of soil organic carbon. The main function of the microbial biomass is to act as bio-catalyst for organic matter decomposition and mineralization, soil fertility, and humus formation and soil aggregation. Microfauna: Animal life too small to be clearly seen without a microscope; includes protozoa and nematodes. Microflora: Plants too small to be clearly seen without using a microscope; includes actinomycetes, algae, bacteria, and fungus. Micropores: Smaller soil pores (less than 60 micrometers) generally found within soil aggregates. Water does not drain freely in micropores. Mineralization: Conversion of an organic compound to a transitional or inorganic form by microorganisms. As a result, nutrients are generally more available and absorbed by plant roots. Mycelium: A string-like mass of individual fungal or actinomycetes hyphae. Mycelium is the vegetative part of a fungus, consisting of a mass of branching, threadlike hyphae. Mycorrhizae: Literally means "fungus root" and is a symbiotic (mutually beneficial) relationship between fungus and plant roots. The fungus supplies water and nutrients to the plant roots while the plant supplies carbohydrates. Plant roots typically can explore no more than 1% of the soil volume but with mycorrhizal fungus (which attach themselves to the plant root cell walls) association, approximately 20% of the soil volume may be explored. Over 80% of plants have a mycorrhizal association but these fungus populations are reduced by conventional tillage and high fertilizer applications of nitrogen and phosphorus. Nematode: An unsegmented microscopic roundworm located near plant roots. Nematodes feed on plants, animals, bacteria, and fungi. Typically found in higher concentrations in no-till and undisturbed soils. They are the most populous animals on the planet. In fact, if we counted all the animals on earth, four out of every five would be a nematode. Non-Humified Carbon: Glucose equivalent or total reducing sugars or amino sugars. This is the most labile fraction of carbon in humus to decompose. No-Till: A system where the crop is planted directly into a seedbed without tilling or disturbing the entire soil surface. The only soil disturbance is for placement of seed and fertilizer. This system is also called zero-till or direct seeding. No-till farming, by definition, means that the soil has not been disturbed since the prior harvest of a crop. Continuous no-till means the soil has not been disturbed for several years. 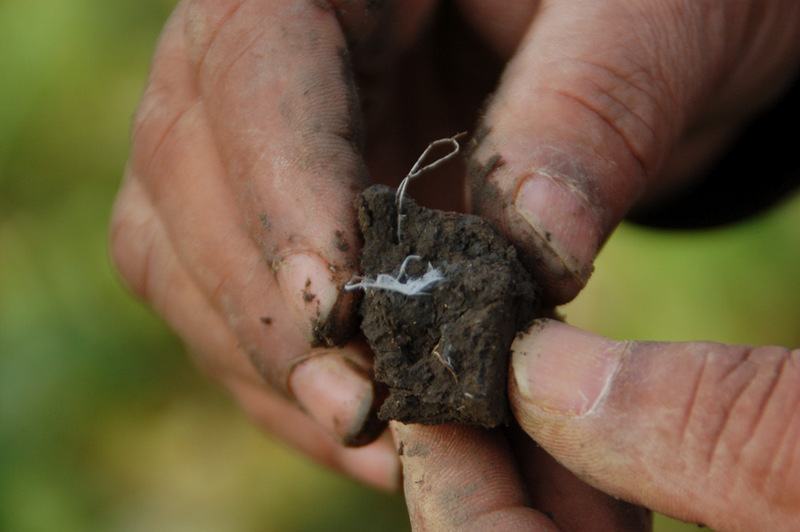 The mycorrhizal fungus hyphae in this soil are pure white while plant roots are off-white or slightly brown. Plant roots explore less than 1% of the soil volume while mycorrhizal fungi hyphae, due to their smaller size, may explore up to 20% of the soil volume and assist the plant roots in absorbing water and soil nutrients. Passive Carbon: Passive pools of carbon that have a slow turnover rate and are more resistant to decomposition and nutrient release. Example: more humified soil organic matter. 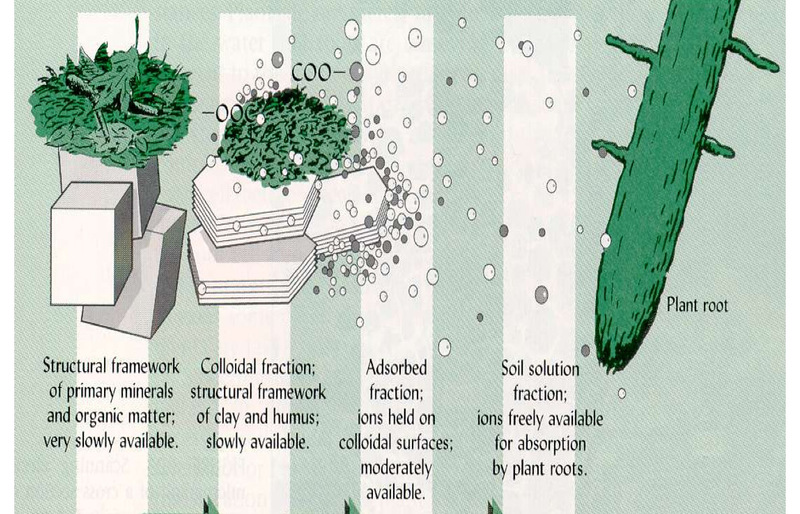 This fraction provides substrate (food and energy) to microbes and acts as binding agents for soil aggregate formation. Porosity: Porosity is a measure of the void spaces in a soil, represented as the volume of voids divided by the total volume of soil. In an ideal soil, the total pore space should be about 50% (composed of air and water) while the solid phases (sand, silt, clay, and organic matter) make up the other 50% of soil volume. Potentially Mineralizable Carbon: Soil organic carbon that is mineralized during microbial decomposition of organic matter or under controlled incubation. Protozoa: Any of a large group of one-celled organisms that move by flagella (flagellates), cilia (ciliates), or have flow (amoeba). Most species feed on bacteria, fungi, or dead microbial particles. Protozoa are more common in conventional tilled or disturbed soils where they outnumber the nematodes. Respiration: The biochemical processes by which all living organisms derive energy from food or stored reserves by taking oxygen from the environment and giving off carbon dioxide. Rhizobia: A nitrogen-fixing bacterium (genus Rhizobium) that is common in the soil, especially in the root nodules of leguminous plants. Rhizosphere: A soil zone near the plant roots where microbes flourish in greater numbers and have more activity than in the bulk soil. The rhizosphere typically supports 1000 to 2000 times more microbes than the bulk soil without live roots. Roots give off many root exudates which supply food for the microbes and increases microbial activity. Specific Maintenance of Respiration (qCO2): It is expressed as basal respiration per unit of total microbial biomass. It is an indicator of soil ecosystem disturbance. A low qCO2 indicates low disturbance and stable no-till situation or a more mature ecosystems; a high qCO2 indicates highly disturbed ecosystems as found under conventional tillage. Soil Biological Quality: Biological properties that are associated with soil functionality including microbial biomass, nematodes, earthworms, biological activity, and enzymes. Soil Carbon Sequestration: How carbon is stored in the soil; the process by which carbon dioxide from the atmosphere is converted to organic carbon by photosynthesis and the decomposition of that plant carbon into organic matter stored in the soil. Soil Chemical Quality (SCQ): Chemical properties that are associated with soil quality including carbon, nitrogen, cation exchange capacity and base saturation, and salt content. Nutrient Cycling—Soil stores, moderates the release of, and cycles nutrients and other elements. During these biogeochemical processes, analogous to the water cycle, nutrients can be transformed into plant available forms, held in the soil, or even lost to air or water. Water Relations—Soil can regulate the drainage, flow, and storage of water and solutes, which includes nitrogen, phosphorus, pesticides, and other nutrients and compounds dissolved in the water. With proper functioning, soil partitions water for groundwater recharge and for use by plants and soil animals. Biodiversity and Habitat—Soil supports the growth of a variety of plants, animals, and soil microorganisms, usually by providing a diverse physical, chemical, and biological habitat. Filtering and Buffering—Soil acts as a filter to protect the quality of water, air, and other resources. Toxic compounds or excess nutrients can be neutralized, transformed, or otherwise made unavailable to plants and animals. Physical Stability and Support—Soil has the ability to maintain its porous structure and regulate passage of air, gases, and water, withstand erosive forces, support heavy loads, and provide a medium for plant roots. Soil Health: Soil health is an assessment of ability of a soil to meet its range of ecosystem functions as appropriate to its environment. Also refers to the condition of the soil, including its ecosystems (minerals, nutrients, and microbial activity), pH, and structure. The Soil Science Society defines soil health as the capacity of a specific kind of soil to function, within natural or managed ecosystem boundaries, to sustain plant and animal productivity, maintain or enhance water and air quality, and support human health and habitation. Soil Organic Carbon: Is related directly to soil organic matter. Soil organic matter consists of 50 to 58 percent soil organic carbon. A simple unit of 1.724 is used to convert total carbon into soil organic matter. Soil Organic Matter: Classified into two major groups composing a humic and non-humic substances. Soil organic matter is thermodynamically unstable and is part of the natural balance between production, decomposition, transformation, and resynthesis of various organic substances. The humified fraction is composed of humic, fulvic, and humin and is the most stable. The non-humic portion is the relatively unstable and most labile fraction and is most easily decomposed. Soil Physical Quality: All the physical properties and/or processes associated with soil including bulk density, porosity, infiltration, and micro- and macroaggregates. Soil Quality: The capacity of a soil to function within natural or managed ecosystem boundaries, to sustain plant and animal productivity, maintain or enhance water and air quality, and support human health and habitation. Soil quality is analogous to soil health. Soil quality is the result of combined activities of biological, chemical, and physical properties as a reaction of management operations. Crop rotations, no-till, and cover crops improve soil quality. Soil Quality Index: Integrated measure of soil quality by transforming and combining selected core biological, chemical, and physical properties into a single index to evaluate a soil's functional capability. Soil Quality Indicators: A measure of a soil's functional state. Scientists use soil quality indicators to evaluate how well soil functions since soil function often cannot be directly measured. Measuring soil quality is an exercise in identifying soil properties that are responsive to management practices, affect or correlate with environmental outcomes, and are capable of being precisely measured within certain technical and economic constraints. Soil quality indicators may be qualitative (e.g. drainage is fast) or quantitative (infiltration = 2.5 in/hr). Ideal soil quality indicators should (1) correlate well with ecosystem processes; (2) integrate soil physical, chemical, and biological properties and processes; (3) be accessible to many users; and (4) be sensitive to management and natural processes. Soil Structure: Combination or arrangement of soil primary particles into secondary units or peds (composed of macroaggregates and microaggregates). The secondary units are classified on the basis of size (microaggregates are the smallest and macroaggregates are the largest) and shape. Soils with good structural stability typically have more macroaggregates and macropores while soils with poor structural stability have more microaggregates and micropores. Compacted soils have poor structure and more microaggregates and micropores. Various soil components are shown in this diagram with the soil availability. Diagram courtesy of USDA. Soil Texture: Relative portion of sand, silt, and clay in a given amount of soil. Texture is important to evaluate soil quality associated with fertility and crop productivity, compaction, hydrological properties, construction, and biological activity. Total Carbon: The total of all forms of carbon in the soil. If the pH of the soil is 6.5 or higher, all the total carbon is considered to be organic carbon. Total carbon (TC) minus active carbon (AC) equals passive carbon (PC). Total carbon is composed of microbial carbon, particulate organic carbon, fulvic acid, humic acid, humin, non-humified carbon (glucose), and calcium and magnesium carbonates. Total Nitrogen: Total of all forms of nitrogen in the soil. Total nitrogen also includes the ammonia that is non-mobile and the nitrate form which is more mobile. Total Phosphorus (TP): Total of all forms of phosphorus in the soil including organic (inositol, phospholipids, etc.) and inorganic (phosphates) phosphorus. Virus: A large group of submicroscopic infective agents that typically contain a protein coat surrounding a nucleic acid core. Typically considered nonliving and are capable of growth only in a living cell. Water Quality: Defined as the biological, chemical, and physical conditions of water; a measure of the ability of water to support beneficial uses. The composition of water as affected by natural processes and human activities depending on the water's chemical, biological, physical, and radiological condition. Water Stable Aggregates: A soil aggregate that is stable to the action of water such as falling raindrops or agitation, as in wet-sieving analysis. Water stable aggregates improve soil quality. Aziz, I. (2011). Tillage and Crop Rotations Impact on Soil Carbon Sequestration. Unpublished Ph.D. Dissertation. University of Arid Agriculture, Rawalpindi, Pakistan. Brady, N.C., and R.R. Weil. (1999). The Nature and Properties of Soils, 12th ed. Prentice Hall, pages 827–862. Schaetzl, R.J., and S. Anderson. (2005). Soils: Genesis and Geomorphology. University Press, Cambridge, MA, pages 741–790.